Oder lösen Sie dafür 4800 Kobo Super Points ein! 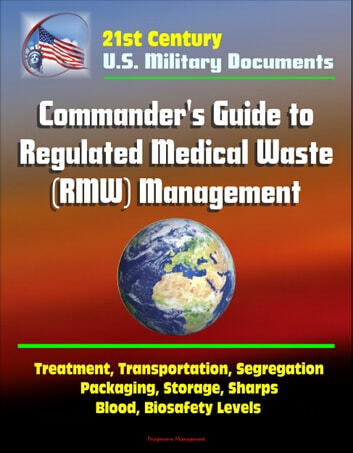 This document provides information and guidance to Commanders of U.S Army military treatment facilities (MTF), dental and veterinary activities, and research facilities on the management of regulated medical waste (RMW). This guide is intended for use by MTF Commanders. It does not reflect specific state or foreign country regulatory requirements. The term MTF used in this guide includes activities such as medical research facilities, and dental and veterinary clinics. 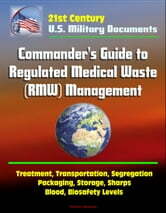 The purpose of this Technical Guide is to assist the Commander in taking a proactive role in the management of RMW by: Providing an overview of present regulations and guidelines; Offering insight to future regulations; Presenting a quick summary of treatment and disposal options; Pointing out state regulations and listing state points of contact. This document leads the Commander through a logical thought process by posing questions and offering realistic and practical answers. While this guide is of importance to the Commander, it also is of great value to the Commander's staff. Antibiotics – Are They Curing Us or Killing Us?